Shell and devein the shrimp, leaving the tails intact. 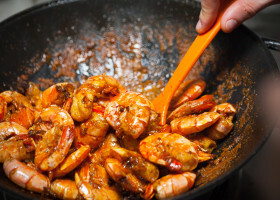 Add the shrimp and marinate for at least 2 hours. Place shrimp on oiled skewers and grill above hot charcoal for about 4-5 minutes, turning once. Brush several times with marinade and serve hot.